Bald patches (Alopecia areata) affects your hair follicles causing patches of baldness in your hair. It is very likely that if you will only have a partial loss of hair and it is likely that hair will regrow of its own volition within 1-2 years. The condition does not permanently damage hair follicles and can develop at any age. It is most common in younger people between the ages of 18 and 40. It affects both men and women equally. What treatment do we recommend for bald patches? 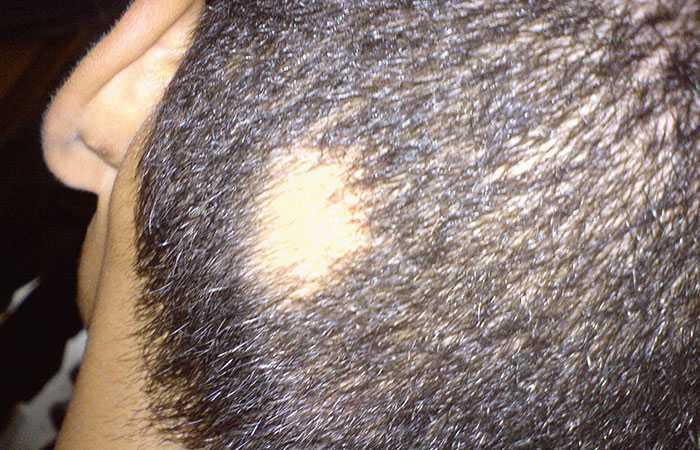 These injections can be used for small, visible bald patches (like the one seen in the photograph above). The injections may need to be repeated after 4-10 weeks. Your hair will usually start growing back within four to six weeks after the first injection. It is important that you’re aware that even if treatment is successful for an area that the alopecia areata may still come back. The cost of injections is £80-£120.